Migrating Waterbirds - Landing on Water Near You! Question: When are taxonomists a positive force for biodiversity? Answer: When they make two new species out of one old one! Just when you thought that you had enough geese now you have more: science has split the Canada Goose (Branta canadensis) into a large-bodied, interior- and southern-breeding species (still Branta canadensis), and a small-bodied tundra-breeding species, the Cackling Goose (now B. hutchinsii). To make things even more confusing, there are four Cackling subspecies and seven Canada subspecies. The obvious difference is size, as shown in this photo. And keep in mind that our resident Canadian, the Giant Canada Goose , is even bigger than canadensis above. And the Giant is really a success story. Nearly eliminated in early 1900’s by over-hunting and loss of habitat, the Giant Canada Goose was believed to have gone extinct by the 1950s. But in 1962, a small flock was discovered wintering in Minnesota. With improved conservation practices and habitat reclamation and preservation programs, their populations have recovered in most of their range. Too well, according to some, but when you build great habitat (short grass near water), eliminate predators and provide lots of food, you have to expect that they will come. Most of the birds you see now on our lakes and rivers will be these Giants. 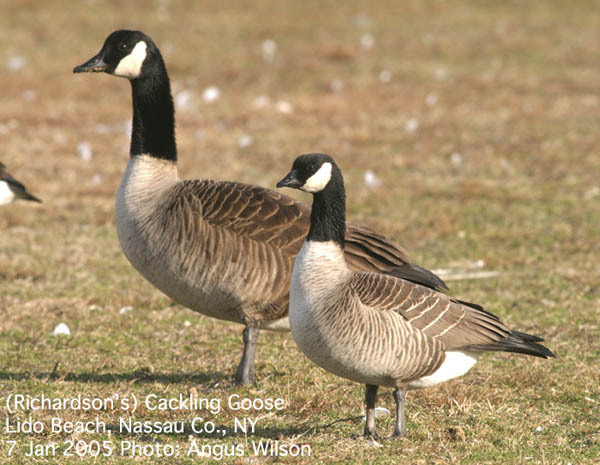 Most of the Cackling and other Canada Goose subspecies will have moved further south, but a few may still intermingle as they rest along their way. See if you can spot any smaller geese when they raft up. also "blue phase" birds with blue-gray colouration) which can occasionally be found among Canadas and other water birds. Vast flocks overfly areas to the east (Greater Snow Goose) and west (Lesser Snow Goose) of south central Ontario while on migration. The occasional bird gets blown off-course and ends up spending a few days with us late in October before moving on. Other arriving waterbirds include Buffleheads, Common Goldeneye and Hooded Mergansers. Departing are those White-crowned Sparrows and White-throated Sparrows that so recently moved in, as well as Red-winged Blackbirds and Common Grackles (a bird in decline across N. America), although the latter two quit using our feeder weeks ago. Porcupines are beginning to mate, if you can imagine what that must be like. Fortunately for the male, the underside of the female’s tail does not have quills. The male also does an elaborate dance for the female, and sprays urine on her head. Why this doesn’t make her very angry is beyond me. This also means that porcupines are a bit more active and wandering. If they’re on the roads, their instinct is not to run, so take care at night. 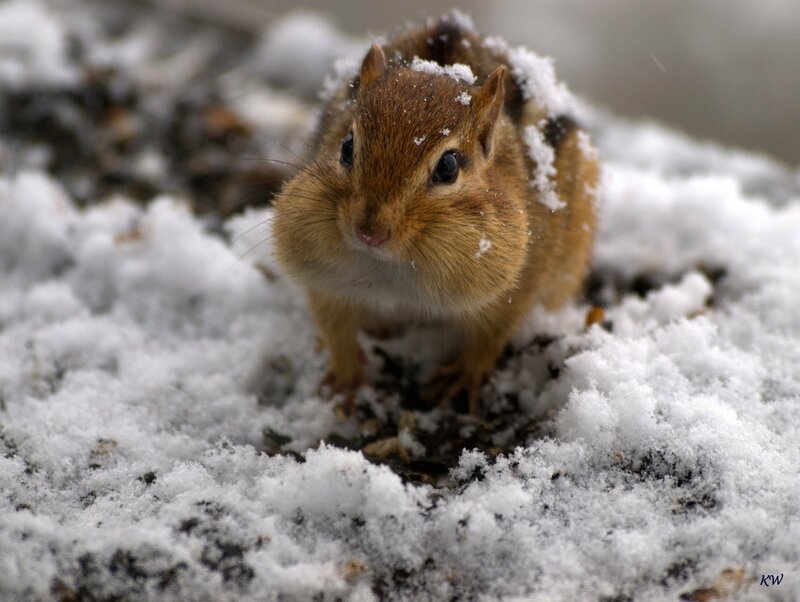 Chipmunks, which have been tearing around the place since spring, retreat to their solitary, well-stocked burrows. They won’t sleep through the winter, but will wake occasionally to eat, and can be seen above ground on the warmest winter days. Eastern Garter Snakes are the last snakes to quit the surface in the fall, and may still be found basking in the sun on the warmest days. Lake Trout are spawning over shallow rubble shoals in lakes when temperatures drop to around 10ºC. Ask anglers about any possible locations in your area. You can often spot them spawning at night using a high-powered flashlight. In Algonquin Provincial Park on Opeongo Lake, researchers (at times with volunteers) have been tagging, and now sonically tagging, Lake Trout in order to estimate population size, survival rates, spatial distribution, tag loss, and fishing pressure, and to improve monitoring technologies. Lake Trout are actually not trout, but a char. For Ontario readers, OMNR&F’s Kids’ Fish Art Contest currently features Atlantic Salmon and Channel Catfish. Learn about and draw one or both of these fishes and win great prizes! You can still find some wasps (which you may have seen a lot of this summer), flies and ladybird beetles on sun-warmed building sides. But frosts have begun - keep your ears tuned for the silence that means the end of most insect activity. Monarch Butterflies should have begun to cross into Mexico on their journey to their highland sanctuary, flying as high as 3350 m/11,000 ft. in search of favourable winds. The migration as a whole is a bit later than normal. We’ll have to wait to see how the population has fared in the face of both recent and longer-term impacts, and Hurricane Michael, whose path intersected a major flyway. Those Heath Asters should be finishing up, ending the wildflower season for another year (but not all blooming – stay tuned). Don’t forget about the Orionid meteor shower peaking on the 20th (see Mid October). If you’re really into Halloween, look for the Demon Star in the Constellation Perseus. It’s a variable, binary star. Halloween, linked to ancient fall festivals, falls midway between the autumn equinox and winter solstice. The full Hunter’s Moon occurs on the 24th, the second full moon of autumn. Mercury and Jupiter appear quite close together in the western sky just after sunset during the last several days of the month. The star Arcturus acts as a ‘ghost’ of the summer sun on Halloween, rising and setting in the same location as the sun during summer solstice.